Mouse anti Human CD3 FITC / CD19 RPE (DC005) staining of human lymphocytes. 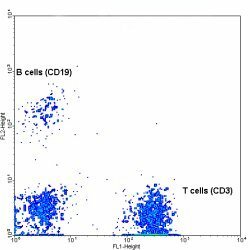 Mouse anti Human CD3:FITC/CD19 dual color reagent may be used to simultaneously enumerate CD3 and CD19 positive cells. UCHT1 recognises the human CD3 antigen, a complex of 5 polypeptide chains with molecular weights of 16-28 kDa, expressed by mature T cells. LT19 recognises the human CD19 antigen, a pan B cell marker.